“I did it!” Capping years of hard work and perseverance, nearly 1,900 graduates of Grand Canyon University attended Saturday’s two commencement ceremonies in the Arena. 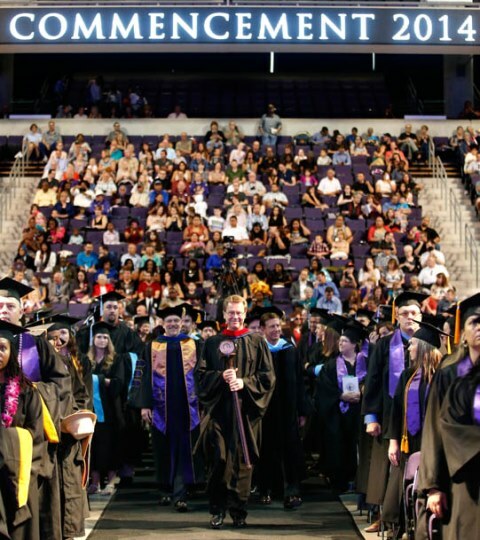 On Saturday, commencement returned to Grand Canyon University’s campus and a more spacious Arena that had been closed for the past two graduations due to an expansion project last spring and summer. The extra seats were a blessing — family members and friends of nearly 1,900 nontraditional graduating students poured into the Arena for morning and afternoon ceremonies. With great pomp and circumstance, audience participation and a bit of flashy magic on stage, the University conferred degrees to students in two new colleges — the Colangelo College of Business and the College of Humanities and Social Sciences (formerly the College of Arts and Sciences) — and in the colleges of Doctoral Studies, Education, Nursing and Health Care Professions and Theology. Dean of Students Pastor Tim Griffin leads the commencement procession at GCU Arena. That selflessness shined throughout the Arena as guests happily traded cameras to take photos of complete strangers and their graduates and, after the ceremony, as dozens of guests who’d been seated in the Arena’s second deck waited patiently on the stairs to the first floor, then collectively and widely cheered as GCU’s newest alumni emerged. 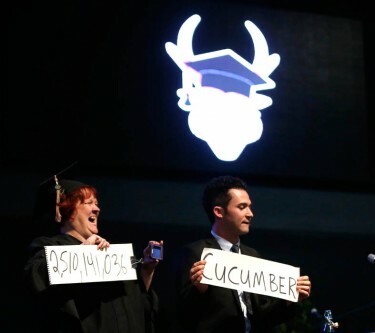 In introducing the commencement speaker, entertainer Justin Willman, GCU President/CEO Brian Mueller talked about the magic of obtaining a college degree through online coursework, as all of Saturday’s graduates had done. “Some people would say that to go back to college at 28 or 32 or 54 or 62 would require a little magic,” Mueller said. “I know you know there is no magic in what you have done. You have written the papers, responded to the discussion questions, carried the people in your group that at times didn’t carry themselves. For Susan Ogunnowo, Saturday ended a journey spanning 36 years and about 6,700 miles. She began a nursing career at age 19 in her homeland of Nigeria, then came to the U.S. with her family in 2002. 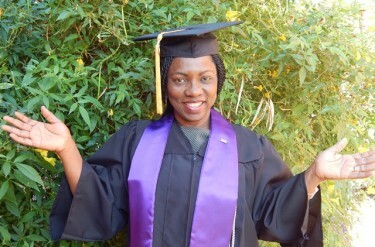 Education for Ogunnowo’s three children, who now work in the fields of pharmacology, electrical engineering and accounting, and for herself — she also has B.S. in Health Education and a Master of Public Health and is working on a Ph.D. in Public Health — was always important to her. The Houston woman started classes at GCU in November, crediting the enrollment staff for piquing her interest and, as time went on, alumni for encouraging her. Ogunnowo worked straight through on her B.S. in Nursing. No breaks. It wasn’t easy. “I didn’t just want to get a BSN, I wanted to make sure I got all the benefits that are attached to that BSN and becoming a nurse in the 21st century,” she said. Currently working part time as a home-health nurse, Ogunnowo, 56, intends to be a leader in her field, from contributing to health education in her African nation, to helping train tomorrow’s nurses in an American hospital. “I’d also like to thank whoever was their first choice for not being available,” joked Willman, who hosts both “Cupcake Wars” and “Last Cake Standing” on Food Network and has appeared on a variety of TV shows. The Los Angeles-based comedian and magician dazzled the audience with his magic, even making a banana “disappear” with the help of a rogue Siri on his iPhone after the robot misunderstood banana for “bandana” (forcing Willman to get a squishy handful of fruit all over himself, though the banana did vanish). Magician Justin Willman (right) had graduates cracking up and interacting with him on stage on Saturday during some dazzling comedic bits. With plenty of laughs to guide him, Willman said he started doing card tricks as a kid after he broke both his arms in a bicycle accident, while wearing rollerblades, as he was showing off for some girls. A doctor prescribed card tricks to build his dexterity and hand coordination as he rehabbed the injury. Just like that, he had found his purpose after winding up in the hospital. Belief, he said, is what makes life a magical experience, and enables us to live and love, and to make the most out of our fleeting time on Earth. If Webster’s had an entry for “GCU cheerleader,” a photo of Vanessa Jones would appear alongside. 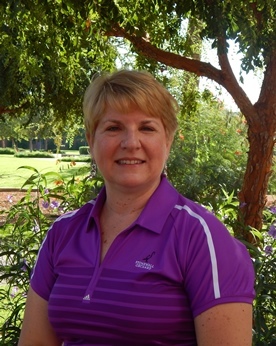 GCU employee and graduate Vanessa Jones is the Lopes Up goodwill ambassador. And she somehow would be wearing three hats: one as GCU’s disability services administrator, one as commencement captain and one as a new University graduate. On Saturday, when Jones wasn’t helping grads and guests with accommodations in the Arena, she donned a cap and gown and received a master’s degree in psychology with an emphasis in general psychology. Then she got back to work. 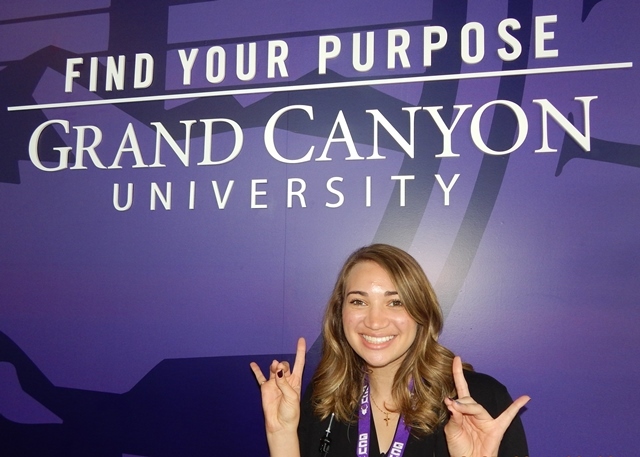 Disability services manager Beth Jamison, Jones’ supervisor, recalls the intensity of the 27-year-old as she was telling a new worker about GCU’s all-employee meetings and oozing enthusiasm about everyone cheering and doing the “Lopes Up” hand signal. “Vanessa’s absolutely an employee who not only bleeds purple, but bleeds purple with glitter,” Jamison said. Jones also has a personal connection to students who may struggle with various disabilities because she has Muscular Dystrophy. “When students talk to her about struggling to get their work done and having all these other things to do, she shares her personal experiences as student, and it’s just very inspiring,” Jamison said. Jones joined GCU as an unpaid intern in 2010, then worked in ground enrollment until 2013 when she moved to Jamison’s team. She has worked one-on-one with students to support and ensure their access to programs and also helped improve their learning tools. For the past four commencements, including Saturday’s, she’s led the team that provides disability services at graduation. 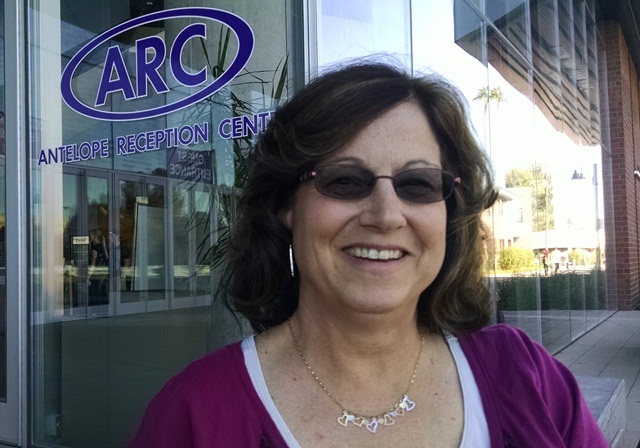 Just earning her bachelor’s degree and master’s was a huge accomplishment for Cindy Norton. Graduate Cindy Norton visited campus with her husband and friend, returning to the campus where she completed her doctoral residency. She was the first member of her family to earn a college degree. But after working 27 years in public schools, primarily as a math teacher, she dedicated herself to GCU’s online Doctor of Education in Organizational Leadership. Norton and her husband traveled from their home in Jonesboro, Va., to rendezvous with a friend in Charlotte, N.C. then flew to Phoenix for Saturday’s commencement ceremony. She had already been to campus for doctoral residency programs but was thrilled to be recognized for her accomplishments with the other graduates. For the 57-year-old teacher, it was the end of a long journey, but the beginning of a new one, too. She hopes the doctorate will help her secure a job at a Virginia university developing math curriculum and educating novice math students, issues around which her doctoral experience was tailored. Her dissertation was focused on remedial math in higher education and the need to address shortages in math-oriented jobs in the U.S. When Carla Johnson looks at her sons, Joshua, 10, and Isaiah, 8, memories and feelings of protection and perseverance come flooding back. Carla Johnson with her dad, Terry, and her sons, Isaiah (left) and Joshua, graduated with honors on Saturday. 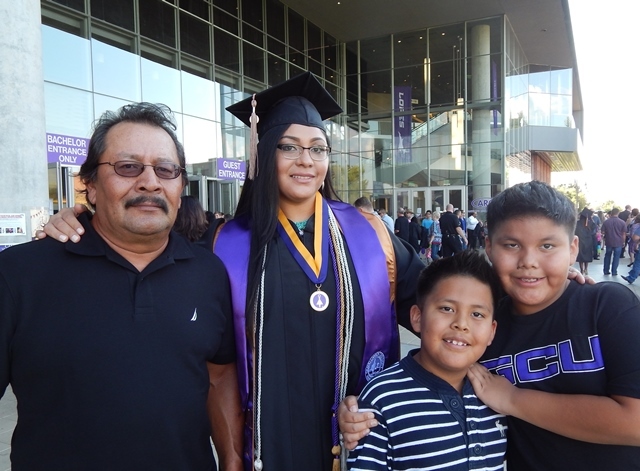 She remembers growing up with parents who had been brave enough to leave the Tohono O’Odham Reservation to go to school, but were challenged by the transition from small village to big city. Her dad was a construction worker with calloused hands and sunburned skin, and her mom struggled with raising the children and working outside the home. “I would stay up with my legs over my little brother to keep him warm and think to myself, ‘He deserves better.’ We all did,” said Johnson, 32. She worked dead-end jobs for 10 years while raising her babies and then, it hit her. “I made a promise to the little Carla that still lives in me that I would fulfill everything she prayed for all those years ago and that all those tears she cried for, wanting better for her family, was not for nothing,” the Phoenix woman said. 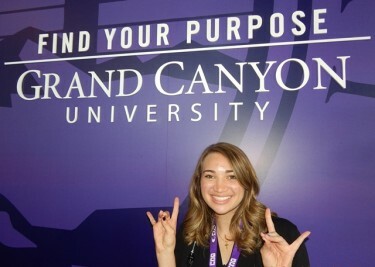 Johnson enrolled in GCU in 2012, visiting campus as often as she could to take advantage of its library and tutoring center. While working full time and being a mom, she earned top grades and was named to the President’s List, then inducted into Delta Mu Delta, the International Honor Society in Business. She graduated with a B.S. in Business Management on Saturday. Among the items on Alice Aschenbrenner’s bucket list: travel, take up golf and earn a Master’s in Business Administration. Pencil ready? 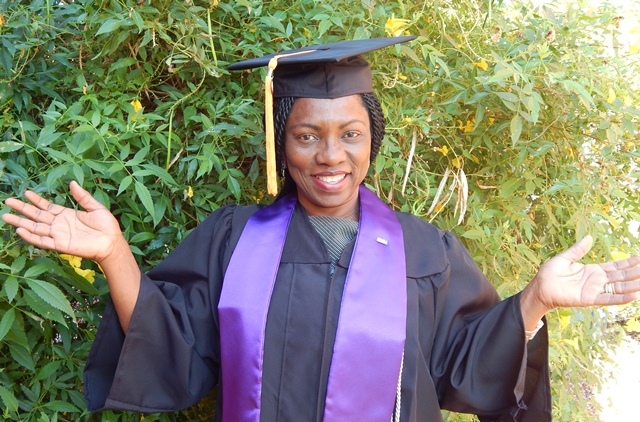 She recently got her first passport and visited Israel, is improving her skills on the links and walked across the Arena stage on Saturday to receive her MBA with an emphasis in health systems management. Aschenbrenner began her degree program while employed in the University’s financial planning and analysis office from 2010 to 2013. She had to suspend her studies when she moved her two teenaged sons home to Minooka, Ill., to be near her parents and their family farm. “However, I turned 50 this year and decided that completing my MBA was a bucket list item and it needed to happen this year,” Aschenbrenner said. She credits her older supervisor, Rick Volk, former vice president of finance, with encouraging her to go for it, and her professors and classmates for their support. Aschenbrenner plans to put her degree to work, but for now she plans to just enjoy life. Sure, commencement is the end of an academic journey, and it was for Howard Diamond. But the event also marked the end of an exhausting 30-hour car ride. Diamond, 45, who graduated with an M.S. in Addiction Counseling, made the trek from Bradenton, Fla., with his wife, father and 3-year-old daughter. It was the first time he had visited Arizona, so the family drove up to the Grand Canyon on Friday, and back down to Phoenix to rest briefly before Saturday’s ceremony. 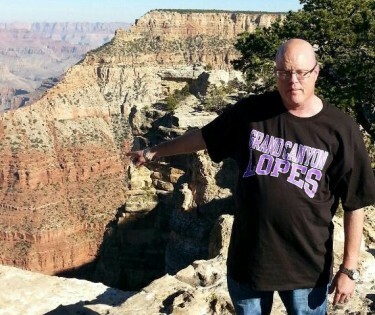 Florida resident Howard Diamond visited GCU and the Canyon on his first trip to Arizona. Rest isn’t a necessity for Diamond, who works from 11 p.m. to 7:30 a.m. at one of his two jobs and is lucky to get three hours of sleep each night. But he still found time to study and complete his degree. Now, Diamond said he has the professional experience and degree to advance in the field of counseling mentally ill clients. It’s often a thankless job, and funding for programs can be irregular, but Diamond said he loves being able to connect with people in need. “I enjoy just helping people improve their lives, to become more independent, and not to rely entirely on others, or programs, or the system,” said Diamond, who’s also been a probation officer. Working two jobs and having a young child added to the challenge of graduate school. Diamond is a vocational rehab case manager for persistently mentally ill patients in a nonprofit organization and also as a mental health tech for troubled children in a separate medical center. The online degree enabled him to work and study flexibly, he said, and he completed his practicum work in his home area. By now, Scott Busch is a seasoned commencement veteran. Scott Busch and his commencement team help graduates Carla Bradford (left) and Christy Dawson prepare for their big day. 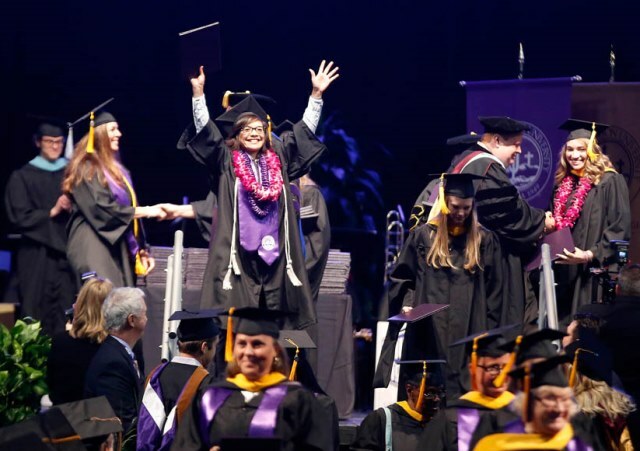 The associate director of GCU’s Office of Academic Records was one of several captains to lead teams of volunteers during Saturday’s ceremonies. Busch’s team from OAR’s class operations group used the experience as a team-builder. They were set up on the second floor of the Arena, greeting graduates and handing out regalia and honors cords. Busch said he volunteered to work the 2011 commencement in which he was set to walk when he earned an MBA with an emphasis in leadership. But he didn’t mind. Since then he’s volunteered to work all of them. There’s just something about being there. “It’s fun to see people at the end of their program and see them get to their goals,” Busch said. I thought this graduation was the most spectacular ever! This is the third time I have graduated in a college setting, however, this was the first time that I have had such a positive response from everyone! I loved the comedian, Justin Willman, the music, by the GCU band, and all the faculty clapping for the graduates as we were leaving. I love GCU! The GCU campus is spectacular. I had such a wonderful and fulfilling experience throughout my time at GCU. I feel so blessed to be a graduate of such a wonderful university that is centered on serving God. The graduation ceremony was spectacular. Lopes Up!!! I was so glad to be a part of the special ceremony Sat afternoon. We drove 10 hours with my husband, daughter, and 2 granddaughters for this special day. My grandchildren have been so excited about “Gammie graduating” that they missed their school fall carnival to attend. My mother and sister flew in Fri and my father was present in spirit. It took me 34 years from my original nursing graduation to finally get my BSN. From the time I walked on the campus, everyone was so nice, caring and helpful offering congratulations with each hello and smile. The commencement was a memory that will last a lifetime. Thank you GCU for a professional experience. This is why we opt for a private college over a state university! Though I live in Central California, I will always be a LOPE! Thank you all! I am so glad I participated in the commencement ceremony on Saturday the 25th. We drove over 920 miles; so my two kids and my parents could see me walk the stage. I can say the atmosphere was overwhelming, and the day was very action packed from beginning to end. 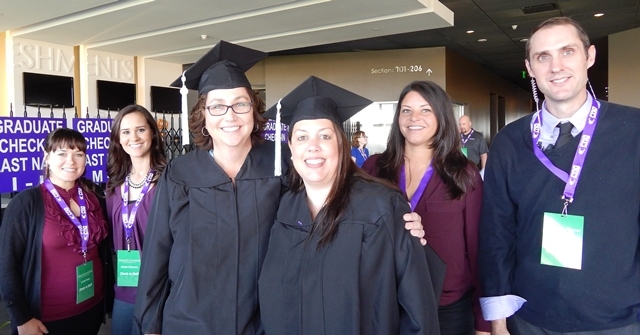 I enjoyed the many pictures that we took of the campus arena area, the scenery around Phoenix, and finally meeting one of my on-line classmates there that come from Colorado to do the same in completing her Bachelors degree journey at GCU. I am glad I chose to walk the stage and make the online program experience become a real life reality. I am glad I had my kids come with me to experience the joy that this day brought, as they are my motivation to do better in life. My daughter missed a school science function of her own achievement to be with me on this day. I will always have many memories good/bad of the program; but always be proud to have participated in this ceremony. The commencement ceremony was absolutely wonderful! It was great seeing some of my class members at the ceremony and finding out that many people traveled so far to attend. I was amazed at how every aspect of the ceremony was intriguing and exciting. This ceremony was far more enjoyable than when I received my bachelor degree. Go Lopes!!! The commencement ceremony was gracious from the beginning to the end. I thank God I was able to attend the graduation ceremony at GCU on the 25th of October 2014. The ceremony was glorious. Everyone was happy and you could see the joy in everyone’s face. I flew in from Texas with my husband and my brother drove from California with his family and mother in-law. It was an awesome moment visiting Phoenix for the first time. During the graduation I was able to see my classmate live. It was amazing. I am so glad for achieving my BSN through GCU. Grand Canyon University is a good school. You distribute the Bible which is the greatest book in the world. I pray God will continue to keep and be with GCU in the name of Jesus amen. Thank you.